Wheel Crazy for a Cure! Thank you for checking in on Team Wheel Crazy's Page! We had a fantastic turn out with our Flavors of Living event on April 6th, bringing in just shy of $3,000 from vendor support, admission, silent auction bids, and random donations! A huge thank you to Lightning 100 DJ Lt. Dan for promoting our event with such passion during the Live Broadcast, and thank you to Dan's dad Don, a Non-Hodgkins Lymphoma Survivor for OVER 20 YEARS for sharing his story on the air during the event! Thank you also to LLS Executive Director of the TN Chapter, Jeff Parsley for coming out with his family and also speaking on the air about the mission and progress of The Leukemia & Lymphoma Society! Thank you to Hilton Garden Inn Cool Springs for donating their beautiful space to our Team, so that we could maximize every single penny brought in that day; and finally, thank you to Hospital Corporation of America (HCA) for reimbursing our team for the few out-of-pocket expenses we did incur to make the event possible. Now we are in Phase 2 of our Team's efforts. TODAY (Monday, April 14th), is Re-Commitment day for participants aiming high for America's Most Beautiful Bike Ride around Lake Tahoe. Nine members of Team Wheel Crazy are making that final confirmation to Team In Training for Lake Tahoe, while the other four will be confirming later in the month to explore the beautify of Tennessee at the Harpeth River Ride. We are serious about reaching (and hopefully EXCEEDING) our team fundraising goals, but we still need your help. Please join us at the following upcoming fundraising events to benefit the TEAM. Why: 20% of all orders placed when the attached flier is presented to the server will be donated towards our TEAM Fundraising! That's huge! 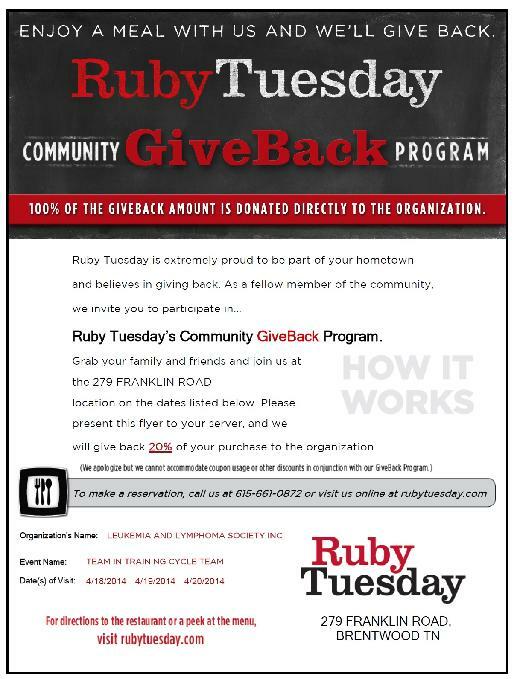 How: Please PRINT the image below and bring it to Ruby Tuesday- Brentwood. Order drinks, dinner, dessert, anything! Bring a big group, too! 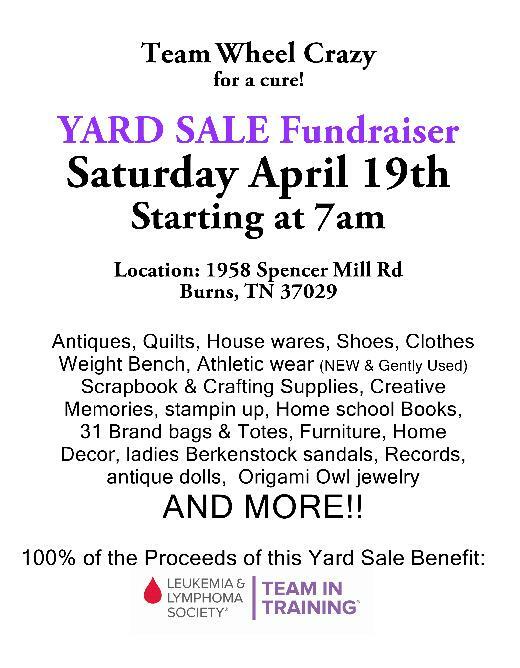 We also have a CHARITY YARD SALE on Saturday, April 19th in Burns, TN. All items in the Yard Sale have been donated by family, friends, co-workers, and ourselves as a way to help boost fundraising for our teammates. 100% of every dollar raised at the yardsale goes to The Leukemia & Lymphoma Society. We will accept cash, Checks made out to "LLS," and we can even accept credit card payments for Yard Sale purchases on our fundraising pages! All dollars donated to their individual pages will also count towards our TEAM Total. As each teammate reaches their goal, they will be removed from the list above. Donating to this TEAM Page will split your dollars evenly among ALL Teammates (including those who have ALREADY reached their goal). We strongly encourage you to randomly pick an individual teammate instead. Our Primary Goal is to FIRST make sure every one of us reaches our minimum, THEN continue fundraising above and beyond that number! Thank you, again, for all of your support in this Journey! Come taste the Flavors of Living: Swim, Bike, Run, Paddle, Hike, Climb! Admission to this event gets you complimentary food samples, access to free demonstrations and amazing discounts at vendor booths, plus a chance to participate in the most active Silent Auction to benefit The Leukemia & Lymphoma Society (LLS), featuring outfitters, clothing, and gear all connected to the theme of active living! 100% of proceeds from this event benefits The Leukemia & Lymphoma Society, and help the Team In Training Cycle Team reach their goal of $40,000 while training for their 100 mile bike rides around Lake Tahoe and/or Williamson County. On the right side of this page, click on the box for "Other" amount. In your donation comments section, mention "FLAVORS OF LIVING." Your tickets will be available at the Pre-Registration table at the event! Can't attend the event, but still want to help us reach our TEAM Goal? Make a general donation to this page, and offer words of encouragement! Honor your loved ones who have, or are, battling cancer by making a donation in their name. Team In Training's Cycle Team is jointly raising funds and awareness in the fight against blood cancer, as we train weekly for our 100 Mile (Century) Rides in June. We call ourselves Team Wheel Crazy for a Cure! Nashville's Independent Radio, Lightning 100 (WRLT 100.1 FM) will be broadcasting from this event live, featuring DJ Lt. Dan Buckley! Stop by the Lightning 100 table for some free swag, request songs, and share your stories connecting you to the mission of The Leukemia & Lymphoma Society. Stroll through our tables of active living silent auction items and find the inpiration to get active, while benefiting a great cause. Starting bids for all items will be approximately 10% of the retail value! Bring your kiddos for only $1 admission per kid under 16 years old, and let them hang out in the KID ZONE! There will be crafts, active living demonstrations geared towards kids (bike safety, how to help your parents pack for camping, how to inflate a bike tire), indoor scavenger hunt and story time. Kids can earn bicycle charms for participating in the KID ZONE acitivies. The more activities they do, the more charms they get! Our KID ZONE will be staffed by adults (for the really young ones), and Ppre-teen/Teen helpers for the "active" themed activities. Your kids will be entertained, while you enjoy mingling with fellow active outdoorsy adults! Difficulty: This is a fun social event and Silent Auction to benefit The Leukemia & Lymphoma Society. Find inspiration among the silent auction items to enjoy the fact that you're alive, and start living a healthier, more active lifestyle! Registration Deadline: Purchase tickets in the RIGHT COLUMN of this page, until Saturday, April 5th at 5pm. Tickets can also be purchased at the door. Parking: Plenty of parking is available at the Hilton Garden Inn- Cool Springs. Children Policy: This is a family friendly event, with a KIDS ZONE! Attendees ages 16 and up may participate in the silent auction items and door prize drawings. Some items are limited to ages "18 and up" or "21 and up" and will be marked with age restrictions. Cancellation Policy: This event is to benefit The Leukemia & Lymphoma Society. No refunds available for admittion to this event. Cost of admission is tax deductible. Weather Policy: This is an indoor event. Since Team In Training's inception 25 YEARS AGO, over 600,000 participants have raised more than $1.4 billion to support the ongoing work of The Leukemia & Lymphoma Society, funding research to find cures for Leukemia, Lymphoma, Hodgkin’s Disease & Myeloma, and to provide education and invaluable services for patients and their families. Team In Training provides endurance training for beginner and intermediate athletes with the desire to complete a half/full marathon, century bike ride or triathlon. 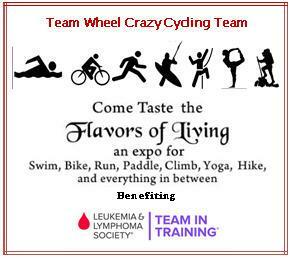 Taste the Flavors of Living is a fundraising initiative hosted by the Nashville Century Ride Team, Team Wheel Crazy, as a means to helps boost the fundraising efforts for individual riders training for America's Most Beautiful Bike Ride, in the fight against blood cancers.